Sadguru Shree Aniruddha gives a brief description of his Five Gurus in the sacred work, the Shreemad Purushartha Grantharaj (Volume Two, Prempravas) authored by him. The chetantattva that is svayamsiddha (equipped with matchless capacities and powers and so self-sufficient) and svayamprakashi (self-illumined), is itself the Parameshvar. The Shraddhavans call it ‘Dattaguru’. Dattaguru, the first among the five Gurus is the Master Enabler, the Lord and Master of the Sadguru Shree Aniruddha’s Anandmay kosha (The innermost of the five concentric envelopes of the deha and is closest to the state of joy). Referring to the following verse from the Sai Sachcharit, Sadguru Shree Aniruddha illustrates the significance of Dattaguru. The above verse reveals the course of Sadguru Shree Aniruddha’s mission, as also his unshakable faith and commitment at the Feet of Shree Gurudatta. 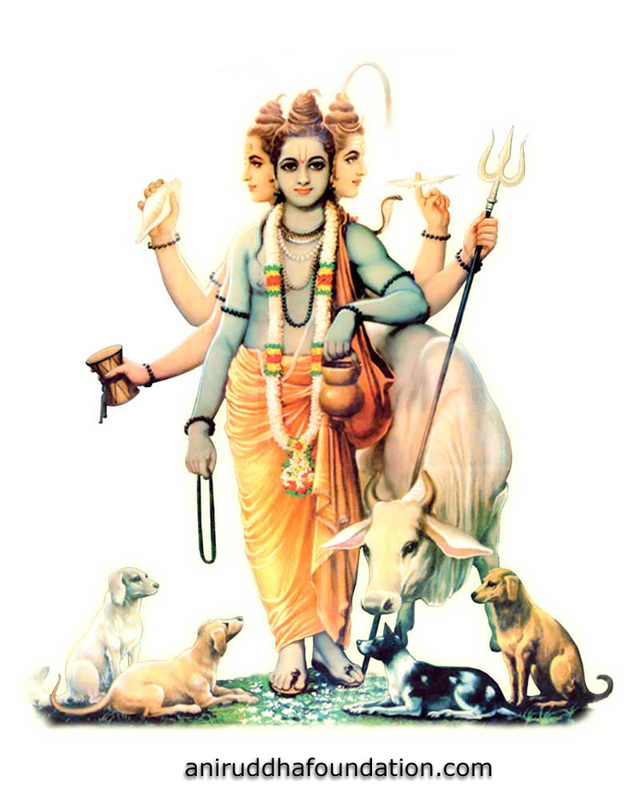 ‘Gayatri’, the very first, the foremost manifestation of the supremely pure, sacred and auspicious Aadimata is active at all times only at the supra-occular level. ‘Gayatrimata’, Sadguru Shree Aniruddha’s vatsalya guru, governs his vijnanamaya kosa (one of the five concentric envelopes of the deha) and is the second Guru. The awareness that ‘I am the Parameshvar’ of the parabrahma is indeed the Parameshvari or the Aadimata whom the Vedas refer to as ‘Gayatrimata’. It is by the grace of the Gayatri form alone, that man is able to attain knowledge in any field or discipline whatsoever and even put it to use and implement it. Prabhu Shreeram is Sadguru Shree Aniruddha’s Guru, who is the Doer (the Subject). 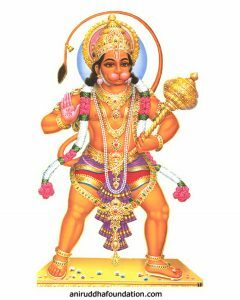 He is the Lord and Master of Shree Aniruddha’s manomaya kosa. The character, the personality, the values of Shreeram is the actual example of the implementation of the principles of maryada (restraint). 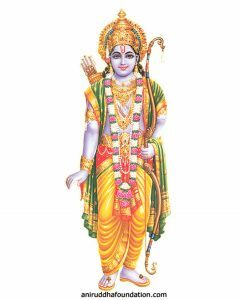 Shree ram is referred to as the maryadapurshottam (the best among men and the one Who adheres to the value of restrain at all costs). Shree Hanumanta, the fourth Guru of Sadguru Shree Aniruddha is his ‘Rakshak Guru’, in fact the matchless ‘maryada rakshaka‘ (He values maryada, abides by it and protects it). Shree Hanumanta, the Lord and Master of Sadguru Shree Aniruddha’s pranamaya kosa and his Protector Guru, who finds fulfillment and joy in calling Himself the server of Prabhuramachandra, and Bapu, ascertains with pride that his mission and life task find fulfillment in humbling himself before and serving this Server. The unique Shree Hanumanta, the One and only who accomplishes the journey from the limited to the boundless, from bhakta to divinity. 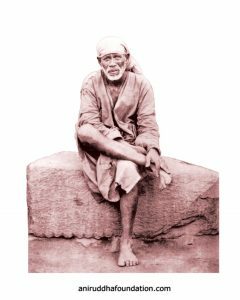 Shree Sai, the fifth Guru of Sadguru Shree Aniruddha is his Digdarshak Guru (the Guru who is the Guide), the Lord and Master of his annamaya kosa (the outermost of the five concentric envelopes of the deha). Sadguru Shree Aniruddha has spoken about Shree Sai in discourses based specially on the Shree Sai Sachcharit which is an account of life and times of Shree Sai on the one hand and guidelines for progress and happiness in the worldly life of bhaktas on the other. 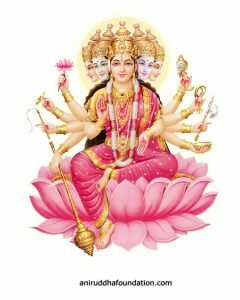 The discourses are Sadguru Shree Aniruddha’s unique expression of love for his Digdarshak Guru as well as for the Shraddhavans. Referring to the Shree Sai Sachcharit in which several verses express the modesty, humility, unpretentiousness and the great unassuming manners of Shree Sai, Bapu says in “Prempravas” Volume Two of the Shreemad Purushartha Grantharaj, “If Saisamartha, the Master of my annamaya kosh, my guru, who guides and directs, pronounces the above words, I assert that I have no right to talk about my immensity or prominence”.